Hola guapas. Today I'm sharing a DIY post on how to make a budget beauty brush holder which is inexpensive yet very pretty. You'll just need to buy some wrapping paper which will cost about €1-€2, the other things you need you'll be able to find at home. Wash and keep the can when you buy tomato paste for cooking. Making the beauty brush holder will take about 5 - 10 minutes excluding drying time. The drying time will depend on the type of glue you are using. For my own DIY beauty brush holder, I picked up some owl print aqua wrapping paper because I think it is a gorgeous colour and print. Plus I'm going for a pastel sort of look for my office/ beauty room. You can pick any printed wrapping paper you like or even a solid colour one, depending on what you find. 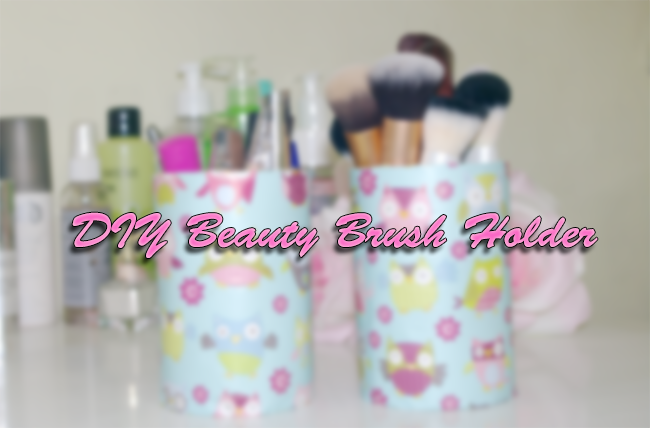 Watch my video in order to see how to make the beauty brush holder or follow the steps below if you prefer. If you like the video, give it a thumbs up & subscribe to my channel. Measure the length of the can you are using. Add about 5cms at the top and 5cm at the bottom. And that is the length of wrapping paper you will need. Place the ruler on the table. Find the line on the can and place this line at the starting mark 0 of the ruler. Slowly roll the can along the ruler until you get to the line again. This will help measure the width of the wrapping paper you need. If you are unsure of the results you get, do it again or add about 5cms. More is better in this case. Measure the required length of the wrapping paper, mark that length both at the left and right. Measure the width of the wrapping paper and mark the width at the top and bottom. Join the marks to create a rectangle. Cut out the figure along the lines drawn. Try to cut as straight as possible. Warp the can in the rectangle of wrapping paper you have cut out just to make sure you have enough to cover the entire can. If it isn't enough, add a few cms and then cut out another rectangle from the wrapping paper. Cut off a bit of scotch. Put the wrapping paper around the can. Make sure the can is straight and you have about 5-6cm of wrapping paper at the bottom. Secure the wrapping paper on the can using the scotch. At the other edge of the wrapping paper, apply some glue and spread it evenly with a brush. Then roll the can so the edges of the wrapping paper meet. Try to make it as smooth as possible. You will now have a tube. Turn the tube around so you are looking at the bottom of the can. Cut vertical 1 inch strips of the wrapping paper making sure you cut all the way to the can. Apply some glue to the bottom of the can and fold in 1 strip. Apply some glue on the inside of each strip and spread it with the brush. Fold in the 1 inch strips 1 after another. I prefer to go clockwise. Turn the can around and cut vertical 1 inch strips. Apply some glue on the inside of each strip and spread it with a brush. Carefully fold the strips inwards. Let your DIY dry and then put in your makeup brushes, mascara, eyeliner pens, lips pencils etc or you can put in your stationary. Doesn't that sound very easy? And the results are great! I am so happy with my DIY beauty brush holder. I currently have 2 and need a few more so I'm going to go with some other colours of wrapping paper but keep the pastel theme. What do you think of this DIY beauty brush holder? Will you try making it?